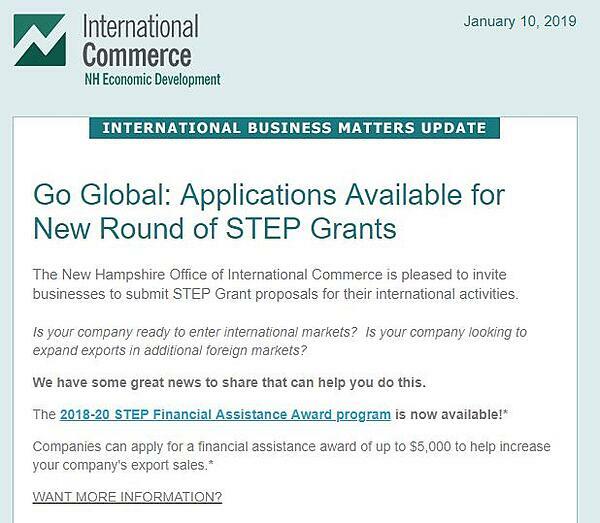 Rapport International is a proud supporter of the STEP Grant program, which provides funds to encourage small businesses to expand into foreign markets. Read more about the NH program and how to apply by clicking on the image below. To learn more about the State Trade and Export Promotion (STEP) Grant Initiative program, or find out who to contact in your state, visit the SBA State Trade and Export Promotion (STEP) Grant Initiative information page. Read about how Rapport International helped a small business obtain a STEP Grant to translate their website and find success in a foreign market by downloading our Case Study: STEP Grant for Translation - Comptus.